September Something or Other, 2013. Saturna Island. Perfect morning. Make coffee. End chapter one. Chapter two, part one. Change light fixture. Change broken outdoor plug cover. Done. End part one. Part two. More coffee. Watch States sanding deck right outside my windows. She’s doing great. Doesn’t need my help. We’re finishing the re-staining of the deck begun last September. You have to do things in stages because you’re not here all the time. Months go by. Magnificent job, States. Magnificent job. She’ll have it done and I won’t have moved a muscle. Thas grand. All calm this morning. Sunlight through the pines and firs. The trees. Through all that forest green. 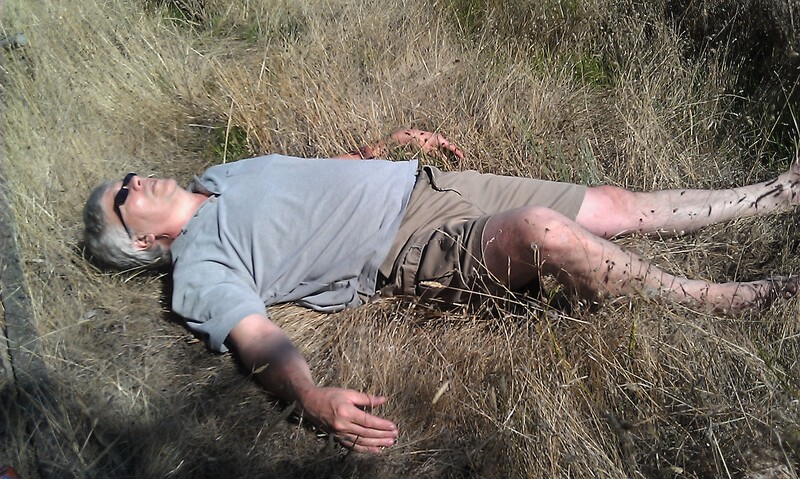 Fell down drunk last night. Didn’t take much. Sometimes even one shot of bourbon is enough. Don’t mention a shot and a half. Was up since 4:00 a.m. so feel the whole experience worth it although in my downfall I scratched my right ankle on a broom stump. You know. Broom. That invasive species from Scotland some twit planted in these isles a century ago. We’re hacking it back. Beans are ready, States’ time-honoured baked beans. Need to seriously think about eggs here. What we do is we dig a hole in the beans in the shallow pan, like a frying pan? Crack the egg and it goes in the hole and cooks and then you eat the beans and eggs. Usually, in fact always, it’s two eggs apiece. Those and of course the beans and a glass of juice or milk and maybe a slice of toast and you can certainly say you’ve had breakfast here today. The deck. Stuff is easy enough to slop on but you’re either on your knees or bent over double plus under the burning rays of the sun and this is work. I’m sweating and groaning but we get it done.. I put a little Willie Dixon on and take a break. It’s 1:57 in the afternoon. Not sure what happens now. Maybe a bit of a look at the distilled spirits course material. Can’t seem to get over as a novelist, moving on to distilled spirits. Simply put it’s wait things out until “Frailty” comes together, my next benighted novel, and try to make a little extra dough as a spirits consultant. Or I could start reading Douglas Coupland, whoever he is, as I’m apparently reviewing his new novel for some newspaper. Done. Jerez Brandy. Solera system. Pot still. Continuous still. Pomme William. Calvados. Fundador, señor. Can’t find the special n with the little squiggle on top in the “Symbol” file. This is messed up. Why isn’t it here? And what the fright is it called, moreover. It’s called a “tilde”. Found it, not in “Advanced” but in the “Symbol Gallery”, as it’s called. Johnny Tilde. So. Versus the Saturna Mouse. Peromyskis Maniculatus Saturatus. Not to be confused with Peromyskis Maniculatus Vancouverensis. Let’s keep it straight, guys. Let’s stay on stream and find a way. More about the indigenous mouse later, if ever. Chapter lucky 7. “Bugs are crawling up my old route. Could we look at it at six? It seems we have rather a lot of catching up to do. Turning ‘I forgot the rest.’ Stuck here on this narrow ledge. Thanks a lot. And I really mean that, son. Thans a lot. The mayhem went well. Thanks for not being here, and I mean that. Appreciate it a lot. Okay. September 13, 2013. Friday morning fog. 10 a.m. We’ve even got the fire going. The wood is well seasoned now and burns well. Fire burning. Out of nowhere the Juncos came. Looking for seed but we have it not. We have coffee, but they’re all coffeed out. Bouncing around with a Kinglet or two it seems, as if that were possible. The flight flies off. Noon and it’s still foggy. 4 p.m. and the sun is out. We drive to the store for a few provisions. Going down the hill from the store homeward bound we pick up a hitchhiker. His name is Cameron, he’s a fairly elderly islander, and we give him a ride to his place on Sunset Boulevard. He has two Siamese cats. “Nootka” is in the driveway and is a friendly feline. “Neptune” is about somewhere but doesn’t come hither as States pets Nootka in the driveway a few moments. Cameron had a slightly gamey odour coming off him from his position in the back seat for the short ride. Gamey and perhaps an undercurrent of alcohol. Well, what else is there to do on this pokey island? But the guy’s got two Schmeezers. He’s gotta be all right. It was foggy around Sunset Boulevard too, he said, but it burned off hours earlier. Found some fresh-looking pieces of frozen spring salmon swimming in the freezer at the store and opted to grab a couple for tonight’s repast. All right then. States is improving the water catchment flow to the barrels on the east side. Brought some “elbows” and strapping and screws from town. We use rain water around here for everything but drinking. When it comes to drinking it’s bottled water, wine, beer, scotch or, a-hem, bourbon. Okay then. September 15. Don’t know what happened to September 14. Lost in the fog, seems like. Foggy fog all around here now at nine o’clock in the morning. Fog and gossamer and dew drop in. Lots of fog horns last night. September 17, 2013. Don’t know what happened to September 16. Heard something drop away and when I turned to look—gone. Rose at ten. Did dishes, which seems to be the ritual around here. Do the dinner dishes in the morning because why bother with them after dinner? Works well. Plenty of water in the tanks and we heat it in the big and bigger kettle on the stove. The stove is old and in need of replacement and we hope to do that by the end of this year. New stove. New fridge. Just a general round of new appliances all around. Would you like a couple for yourself? Septic tank. Need to have another look. Right after lunch, not before. Septic tank and the realization that your literary ambits are not being fulfilled. It seems a cruel parody, Mesdames et Messieurs, of a fruitful something of a career instead of this agonizing non-entity. Be that as it may, mates, I step outside to pick some lint and hair off my old MEC lightweight fleece top and hear this scrabbling on the east side of the deck around the corner. I look and see this hairy thing approaching me at a waddle. It is a semi-elderly marauding black and bit of white Corgi dog. Yes. A Corgi or corgi has chosen to visit us and we know not from whence he came. As far as we can tell he is a male. He is very friendly. He waddles around the deck. Even takes a look inside the house. Occasionally, however, he gets into fits of barking. Later. He’s already been here an hour and shows no signs of leaving. For a while we thought he might be trying to tell us something, but he is not trying to lead us anywhere as in the old Lassie/Rin Tin Tin/Littlest Hobo. He’s content to just lie around. He spends a long time lying out by the car having a little siesta, but now we’re taking off so it is presumed, once we’ve gone away, that he will return to his own environs. Mystery corgi. We’re callin him “Corgi”. He comes down the path again and has some of the water we put out in a bowl for him. He’s barking again. Maybe he’s trying to communicate to his handlers, who can’t be all that far away, that there’s people here, and usually when he stops by there’s no one here, so it’s a change for him and not only for him, but for us as well. We can hear a drill or something coming from not too far away, to the East, I think, and perhaps it’s the driller’s Corgi. There’s just no way of being sure right now. We’ll try not to run him over as we leave down the driveway, if he follows us to the car. He moves pretty slowly and seems a bit arthritic. We left Corgi in the driveway and drove to the store. He was obviously used to going for car rides because he very definitely wanted to come with us. He was eager. I stayed with him as States drove to the road. We didn’t want any squashed, arthritic Corgis besplattering our leafy parking area and driveway. I got in the car at the road and Corgi was making his way towards us. We drove off and could see him in the rearview mirror standing in the middle of the road watching us disappear. At the store we talked to a couple of people and Corgi’s name appears to be “Reggie” and he’s owned by the Janzens. 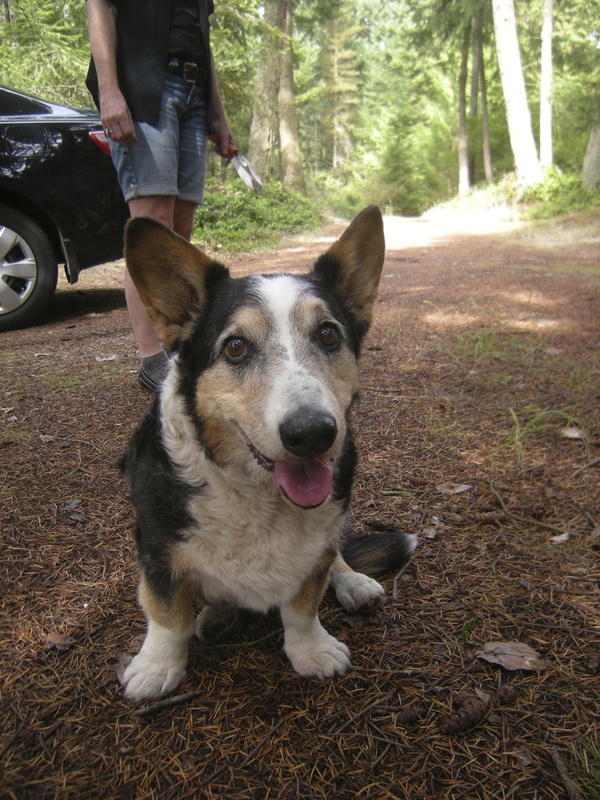 If Harvey Janzen was in the area doing a job he may have had Reggie with him and Reggie matches the description of the kind of lost seeming Corgi we felt kind of sad about driving off on. The store lady gave States the Janzen’s number and States talked to Pam Janzen on the store phone. Pam Janzen said she could come and get Reggie if need be. We got back here and no Reggie so we hope he’s been returned to his sanctuary. Come on in, Reggie. It’s supper time. Reggie update. September 19, 2013. Reggie the corgi indeed made it home. We’ve sent a picture to the Janzens. Pam Janzen said seeing old Reggie always makes her smile. This entry was posted in Serenities. Bookmark the permalink. Eggs with beans. Sounds good but sounds English. I wonder if it would go with my single malt Bushmills ? I see no inconsistency. They make good whiskey in Bushmills. Been to the distillery. Thanks for the comment. I keep running into dead-eyed refugees from the bookstore. Hope you are doing okay, dude. Finally read your September entry. What a great read. I want to know the origin of the name ‘States’. Very curious. Also love Reggie, was so glad you added the update, I love a good cliffhanger but that corgi is darn cute I was glad to know he’s okay. I’m going to try to do a sketch of him. Keep on keepin’ on.